Home › Blog Entries › Cause for Laughter? 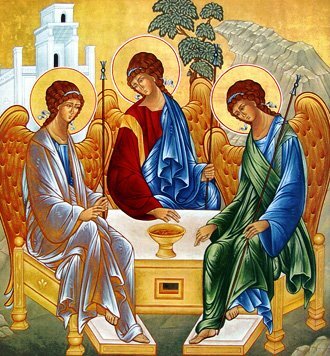 In Genesis 18:1-15 we have the story of three “men” who appeared to Abraham and his household. With the good hospitality of the day, Abraham and his household made these strangers welcome and gave them the best of their food. It’s clear in the story that these three visitors are not merely what they might appear to be on the surface. As the story progresses it becomes clear in verse 13 that the LORD is present. The Hebrew text shows that YHWH, God, the Eternal One is there having a conversation with Sarah and Abraham. And the message is that Sarah will conceive and bear a son. The text makes it quite clear that Sarah and Abraham are well on in years. Sarah is long past the days of child bearing. So, as Sarah overhears this message of a coming child – a son – and their firstborn at that, she give a response that seems quite natural given her frame of reference – she laughs. Now, it’s easy to be hard on Sarah for this response. She laughs in the face of God’s message of what is to come, and not just a rough idea of what is to come from a spokesperson of God. No, Sarah overhears the Eternal One telling Abraham that she will have a son. It seems so easy to judge Sarah for her response. But, how many of us could say that we would have a better response? Perhaps you or I would not laugh when we hear such a turn of direction for our lives, but don’t we often respond with similar disbelief at times? The thing is, no one expects something unexpected. It’s a fact of life. Even when told by well meaning people to expect the unexpected, there is no preparing for the things we have no idea are coming. Sarah is not expecting this message that she will have a son. So, she responds with a laugh that is both instinctive surprise and perhaps a bit doubtful. She responds to the unexpected news in a genuinely surprised fashion, albeit one that is undoubtedly tainted with disbelief. But I know from personal experience in my life, and in conversation with others, that responses like this are the all too typical responses to the unexpected from God. Oh sure, we would generally agree that we expect to be blessed, and full of joy in an abiding relationship with Jesus Christ. We tell ourselves and others that Jesus is in charge of our lives, and we will follow God wherever we are led. But deep down we all, I think, have this innate expectation of what that leading will be like. We expect that the road that we are on is the one that God has placed us on, and that God will continue to lead us down the road we are familiar with. This is not always the case. God leads us where God needs us to go. He cares for us and pays attention to our desires and abilities, but I think God longs for us to simply let go of all of our expectations and kneel before Him with simple obedience to go anywhere and do anything. This is not easy. We are creatures of habit and routine. We like to know what is coming, and where we are going. Following God in true obedience means that we may not know what happens next week or month, let alone next year. For instance, my wife and I unexpectedly went from being friends with no intentions for more, to being husband and wife in less than one year. A lot can change in a short period of time, and those quick shifts can leave our head reeling with confusion or disbelief. Not because we don’t trust God, but because we too often get settled into our own ideas of what is going to happen. If we are going to call ourselves Christ followers, than it is important that we genuinely live our daily lives following Christ. When we do so, we understand that all of the details of our lives are no longer our own. We belong to God – even our expectations.